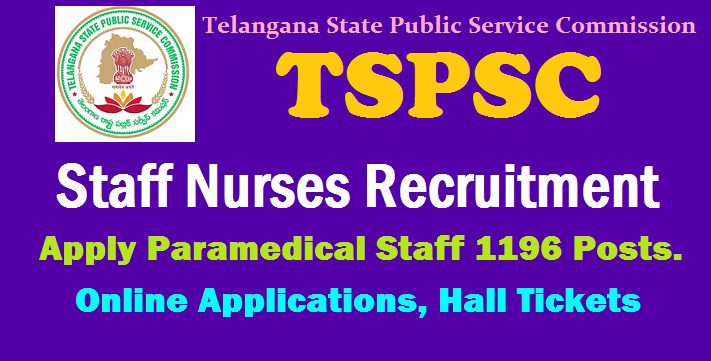 TSPSC Staff Nurses Recruitment 2017, Apply Paramedical Staff 1196 Posts. TSPSC Telanagana Para Medical Posts Recruitment 2017: TSPSC Health Department posts Nursing, Paramedical Staff, Other categories Recruitment 2017 TSPSC Staff Nurses Recruitment 2017, Apply Online: Telangana State Public Service Commission: Hyderabad issued Notification No. 57/2017,Dt. 08/11/2017 to direct recruitment of Staff Nurse in Director Of Public Health & Family Welfare And Telangana Vaidya Vidhana Parishad (Health, Medical& Family Welfare Department). Online Applications are invited online from qualified candidates through the proforma application to be made available on commissions website www.tspsc.gov.in The submission of online application is from 16-11-2017 and last date for submission of application is 11-12-2017 the details like TSPSC Staff Nurses Posts Online application form, how to apply, hall tickets, Answer Key, Selection list Results, Exam pattern, Selection procedure for TSPSC Paramedical staff, ANM, Lab Technician, Staff Nurses, Pharmacists and other posts 2017 and more details are given below. No.Of Vacancy : 1196 Posts. Last Date : 11/12/2017 is the last date for online process. a)Must have passed XII Class or Intermediate or its equivalent examination recognized by Government. c) Registered with AP/TS Nursing Council. Age Criteria : Candidates age limit should to be 18 – 44 Years. Maximum Age (44 years): A candidate should not be born before 02/07/1973. The Upper Age limit will be relaxed as per Rules (shown in the table) and will be calculated on the above lines. a) FEE: (Remittance of Fee) Each applicant must pay Rs. 200/- (RUPEES TWO HUNDRED ONLY) towards Online Application Processing Fee. This apart, the applicants have to pay RS. 120/- (RUPEES ONE HUNDRED AND TWENTY ONLY) towards Examination Fee. However, the following category of candidates belonging to Telangana State only are exempted from payment of Examination fee. The Fee mentioned at Para-I(6)(a) is to be paid online through SBI ePay duly following online instructions once the application form details are submitted by filling TSPSC ID, date of birth and other particulars. The fee once remitted, shall not be refunded or adjusted under any circumstances. Failure to pay the examination fee, application fee, wherever applicable will entail total rejection of application. The list of Banks providing service for the purpose of online remittance of fee is given in ANNEXURE – II. Documents: Candidates are requested to keep the details of the following documents ready while uploading their OTR Applications. and date of issue for uploading in OTR. application if not registered earlier to obtain TSPSC ID. While filling the same, the candidates have to ensure that there are no mistakes in it. The Commission bears no responsibility for the mistakes, if any, made by the candidates. furnished by the candidates. The ID No in the PDF Application form has to be quoted for future reference/correspondence. considered for the purpose of this Notification. Note: The Commission reserves the right to conduct the Examination either COMPUTER BASED RECRUITMENT TEST (CBRT) or OFFLINE OMR based Examination of objective type. Before applying for the posts, candidates shall register themselves as per the One Time Registration (OTR) through the Official Website for TSPSC. Those who have registered in OTR already shall apply by login to their profile using their TSPSC ID and Date of Birth as provided in OTR. TSPSC Dental Assistant Surgeons 2017 Recruitment, Hall tickets: Hall tickets can be downloaded 7 days before commencement of Examination. ⏩ Hall Tickets can be downloaded 07 days before commencement of Examination. TSPSC has issued notification for recruitment of 1261 various posts in Health Medical & Family Welfare Department, Insurance Medical Service and Telangana Social Welfare Residential Degree Colleges (TSWRDC) Women. Of the total posts, 1196 are of staff nurse in Directorate of Public Health and Family Welfare (DPH&FW), Telangana Vaidya Vidhana Parishad (TVVP), 35 radiographers in DPH&FW, 21 Health Supervisors in TSWRDC (Women), six physiotherapists in TVVP, two Paramedical Opthalmic Officers in DPH&FW and one refractionist in Insurance Medical Service.